Innermann portraits a lot of reggae, ska and dancehall artists. All photos were taken in black and white. Black and white because of its purity, simplicity and reduction. The pictures of the artists were taken on stage, in a private surrounding, in nature and so on. A lot of different locations. Until now “Innermann” is a book prototype with about 230 pages. The layout is already finished and the size of the book is 148mm × 210mm (A5 – landscape format). “Innermann” is ready to leave the prototype status and awaits printing. Therefore I am looking for a sponsor. I´m trying to get “Innermann” published. The goal for the first edition should be 500 copies. While reading on keep this in mind: what I´m writing here are my thoughts on how a sponsorship could be possible. Maybe you have some good or better ideas how to find another form of sponsoring? If so, i would be glad if you could leave your ideas or thoughts on how to sponsor Innermann in the comments. This should be an open discussion. The more open the better. I´m looking for a partner/company that is really interested in supporting either artful work or reggae music as such. The sponsor should pay the price for the printing of 500 copies. The costs will be around $ 6.000. Your company is presented inside of the book. There are different possibilities how to achieve a good solution, for you as a company and for the readers. The first possibility is to name your company on the first page, e.g. “Innermann was made possible by “name of your company”. If your company is really connected to reggae, e.g. if you are a record label, a soundsystem, an artist, it is possible to show informations about you on 2-4 content pages inside the book (text and images), depending on the informations and images you are sending. This is not a classical advertising like in magazines. It is meant as additional information to the readers of “Innermann”. I would just call it “Infotisement”. I will design the layout of 2-4 pages in “Innermann”. This is included in the price. I can send you the layouts so you can use it for other publications, informations, advertisements. 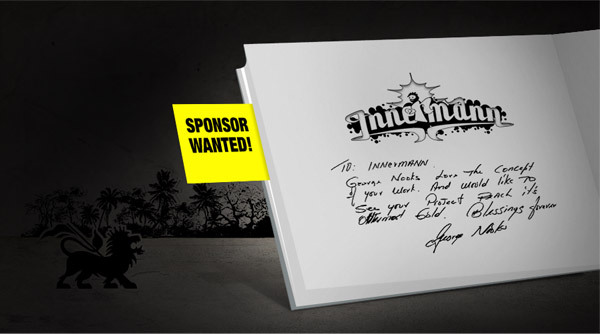 You as a sponsor can buy up to 200 copies of Innermann. You get 50% discount on the official selling price. As an exclusive sponsor you have the chance to use the book as a premium to entice customers or customer appreciation. The other possibility is to sell the books at your company and to friends for the regular price. The goal is to find 12 “exclusive” sponsors. Your company is presented inside the book with a classical advertisement. There will be 3 pages with advertisement inside “Innermann”. There will be will be 4 ads (sponsors/companies) on every “advertisement page”. The price includes the layout of your advertisement for the book. I can send you the advertisement later so you can use it for other advertisements if you want to. Please write me your proposal. Or tell me what kind of sponsorship you think about. Thank you.